It's finished! It's finally finished! I've finally added the finishing touches that pull everything together. 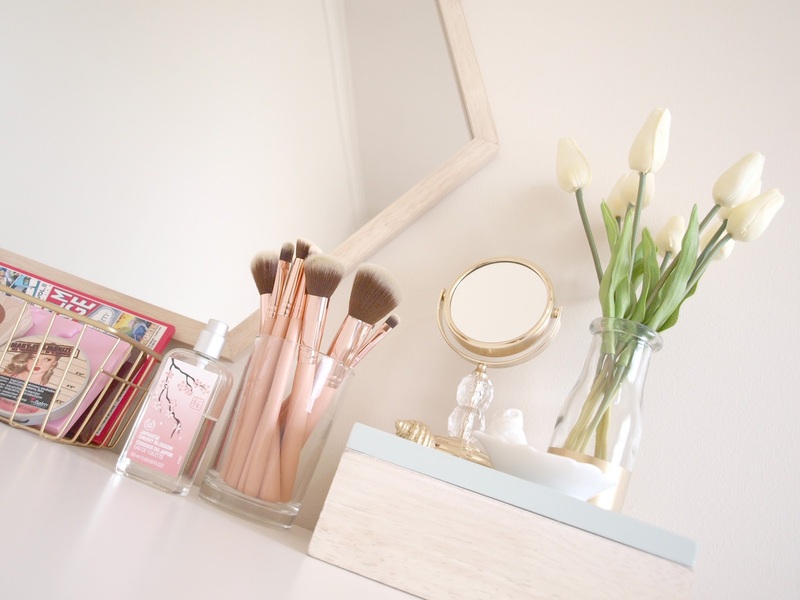 It's taken me more than a month to set the vanity up just the way I liked it, but the overall project, including the planning, took much longer. I started planning this project late May, but because of my spending ban and the fact that my then-housemate had yet to move out, I couldn't get started on it until the beginning of August. It took a while for me to figure out what kind of style I wanted, what I wanted on the desk, and what I needed to buy versus what I could upcycle/DIY. Along the way, I realised that the style I had in mind was Kate La Vie meets Kate Spade, with some animal motifs thrown in. 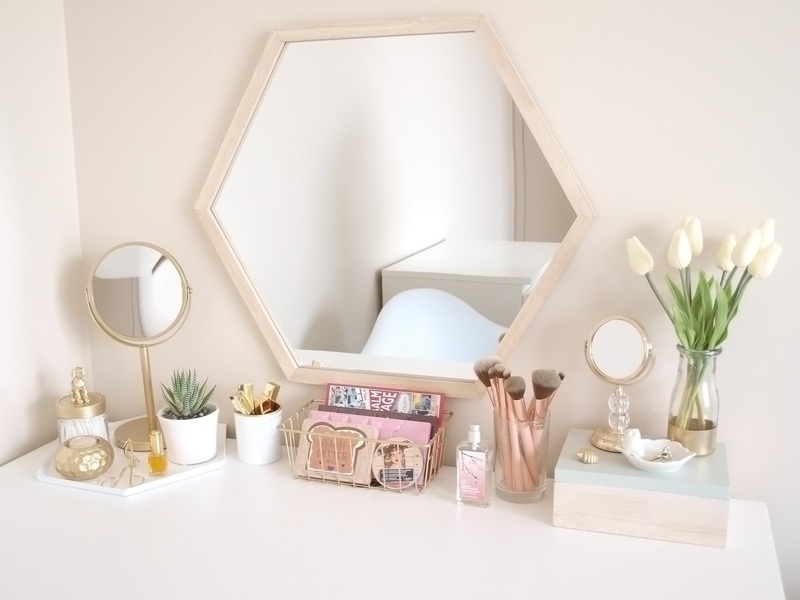 The main mirror and hexagon tray were definitely inspired by the blogger. I had a couple of other things I planned to get for the vanity but I left them till last so I could see how the whole set up looked before I bought more stuff. Once I got to arranging the desk, I breathed a sigh of relief that I didn't give in and buy that elephant I was eyeing. You guys might notice that I don't have any picture frames or typography, and this is because, a, I couldn't find artwork that I liked enough, and b, I'm not too keen on typography when I think it's overdone and soon to go out of style. I did a post a few weeks ago on the progress of the battlestation, but for convenience sake, I'm going to cover everything I showed then, as well as the rest of the vanity. In that post, I mentioned that I was spray painting several items gold and white, and they included the wire basket that I bought from Daiso last year, a jar, the lid of which I superglued a toy dog, a tealight candle holder that was once silver, and a mini milk bottle. They were all stuff that I had lying around then, including a votive that once held a candle, which I painted gold on the inside and white on the outside. I since then fixed up the rim of the votive so that the lip was clean and straight. I use it to store my Milani Amore Matte Lip Cremes. I bought a set of hexagon trays from Kmart while it was on clearance and painted the main one white, while one of the two halves was painted gold, and the other left pink, left aside to be used as prop for photos. I had plans to paint the tall glass for the brushes, but after thinking on it, I decided that the new brushes from BH Cosmetics were enough to decorate it. I painted a seashell I had lying around gold just for fun, and I think it adds a cute touch. My gold paint of choice was the White Knight Squirts Spray Paint, it dried evenly and quickly when thin coats were used, and it had the right shade of gold that wasn't too bronze, yellow or champagne. One of the staff members at Bunnings actually sprayed swatches onto a sheet of cardboard with most of the gold paint that they had, and that was how I decided on the White Knight paint. I had to buy a makeup mirror because I noticed that I was leaning too close to the hexagon mirror while putting on my face. The desk dug into my stomach so it was uncomfortable and made the process long and tedious. 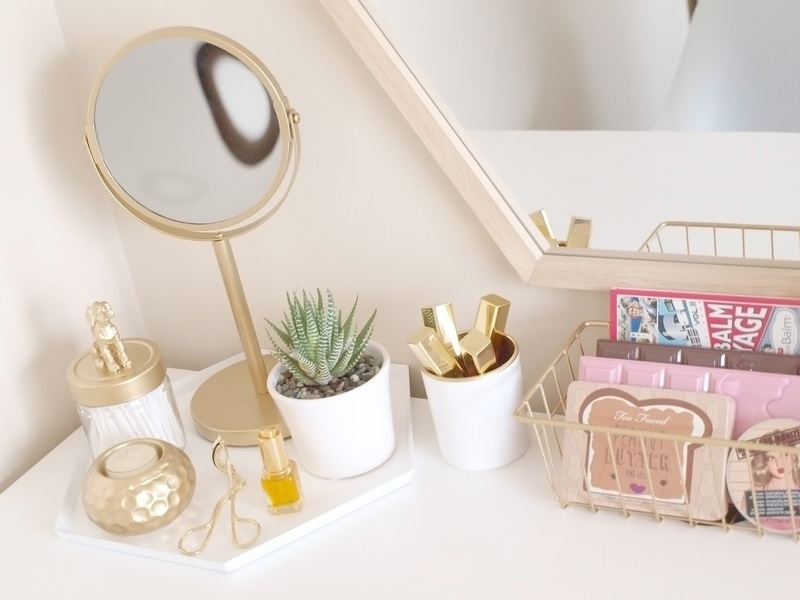 I tried to find a gold mirror to match my vanity but no one, nowhere, was selling them. Copper, sure, but gold? Fat chance. I threw in the towel and grabbed an ordinary silver one from Kmart with 3x magnification on one side and sprayed it gold so that it matched the rest of the vanity. I did a tutorial on that and you can find it right here. Oh, and I found a gold eyelash curler! It was from Daiso so it cost me less than $3. I don't need to curl my eyelashes, but it doesn't hurt to have one on hand for when I want even curlier lashes. 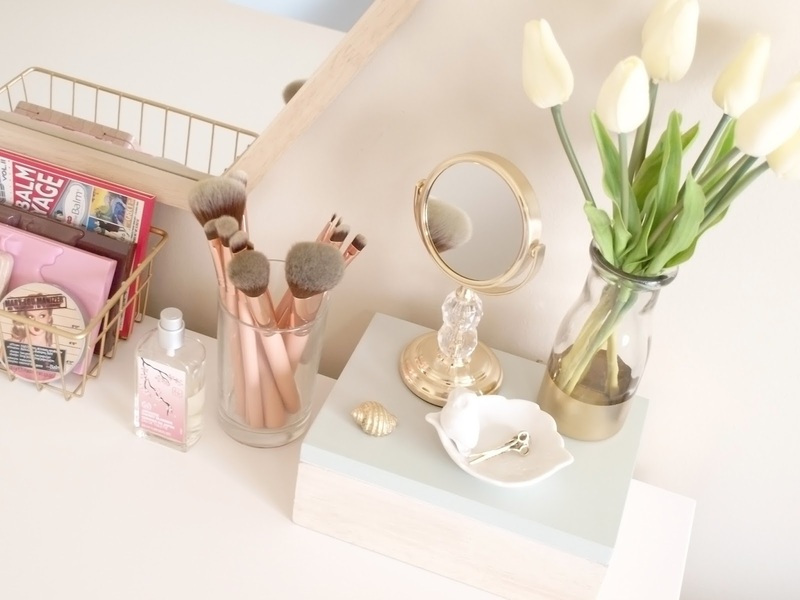 It adds a nice touch to the vanity, just sitting there innocuously on the tray among the other pieces. In my little owl jewelry dish, I have a little gold brooch in the shape of scissors that my mum gave me. It was from this collection of jewelry relating to sewing machines. In fact, I have another gold brooch in a box somewhere that looks like a part from a sewing machine. 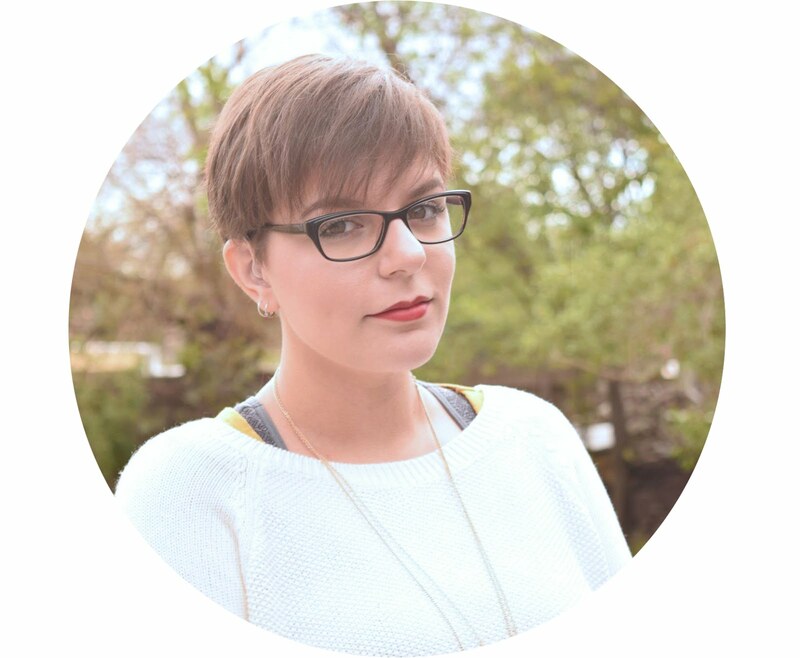 I use the scissor brooch to pin back my hair because it has a clip with a toothy edge. My friend Cat sent me a cute little mirror in her last care package and I just love how it's so small and shiny! If you're at all curious about the US Care Package, here's the link! I'm dying over theBalm's palette and it sits on my vanity behind the chocolate palettes from Makeup Revolution. The perfume on the vanity is from The Body Shop and was a gift from when I turned 21. I'm still on the hunt for a new perfume, and it's hard trying to find something that is cruelty-free and easily accessible here so I can get my partner to smell it for me, instead of blindly buying something online. I just found out that Chi Chi Cosmetics sells perfumes so I'm going to check those out soon. So far I like the idea of the Romantic Flowers scent, as well as the Vanilla Orchid. Here's the entire battlestation in one shot! I'm so happy with how it turned out and I love that I didn't have to spend so much money on it. It's really Instagrammable, if I may say so myself! 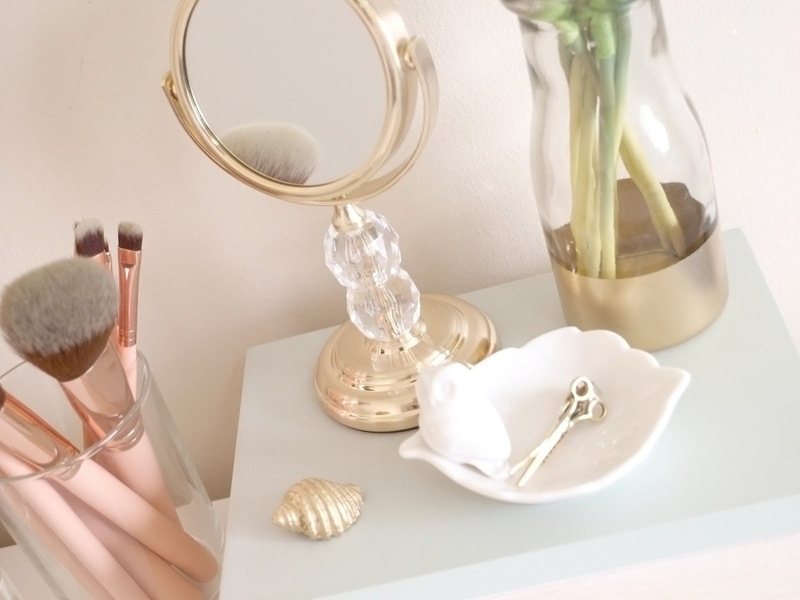 My favourite part is the little mirror on the right, and I have to thank Cat for it once more, it's so cute and adds a touch of bling to the entire vanity. I love having this little place to myself in this unit, it screams me and feels really personal and comfortable. Sean thinks it looks really girly, so I flipped him off, haha. I told Sean how I was really happy with the way the battlestation looked, and he was like "Why would you name a place that is meant to be relaxing with something that sounds aggressive?" I had to laugh a little bit before telling him that it was a place where I prepared to take on the day, as well as where I worked on my blog. It had to have a cool name, sir! What do you guys think of the battlestation? What are your favourite pieces, if any? THIS LOOKS AMAZING! You did a fabulous job - I am in LOVE with all the gold. Seriously envying that right now haha... mine looks like a bomb went off LOL. THANK YOU! I am in love with all the gold too! I'm having a hard time keeping it clean because I keep dumping stuff on it like tea cups, notebooks, my camera and so on XD A very hard habit to kick!